I joined this group not too long ago (like a week or so, really…) and really like the idea of how this works! Plus, it gives me extra motivation! I love working on small things, mainly for the “instant gratification” that goes along with them! So, here is one of my small projects for sharing! And don’t worry, I have more to share as later! 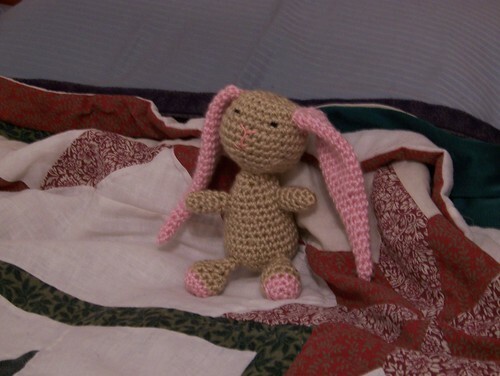 This rabbit I made for my son, Alex, for Easter. I used the “Best Bunny” pattern from Lion Brand Yarn. I just think it’s sooo cute. I also made another one for a coworker and her daughter but didn’t have time to get a picture of it before I had to give it to her. This was also my first attempt at amigurumi and I think I really like it! In fact, I have a monkey to make for my little one now and will gladly share that too whenever I get done with it! Adorable! I didn’t think I’d like amigurumi much, but when I did my first one, I was hooked. I did this just to give my son something handmade for easter, instead of opting out and going to the store to buy him something stuffed. I think he appreciated it more than some of the other stuffed toys he has received, too, so that made it worth the effort. So very cute – I’ve been wanting to try that pattern! WARNING!!! You have just started a VERY addictive hobby! Very cute. Look forward to seeing your next project.